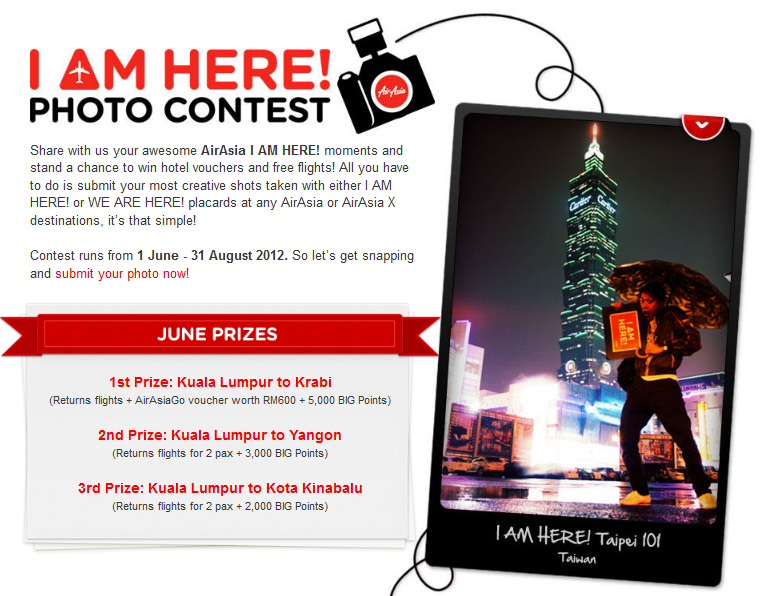 Share with us your awesome AirAsia I AM HERE! moments and stand a chance to win hotel vouchers and free flights! All you have to do is submit your most creative shots taken with either I AM HERE! or WE ARE HERE! placards at any AirAsia or AirAsia X destinations, it’s that simple! Contest runs from 1 June – 31 August 2012. So let’s get snapping and submit your photo now! Download any of the four I AM HERE! or WE ARE HERE! placard designs and print it on A4. Those with tablets, save these designs and flash them on the screen. Shoot your funny/crazy/creative poses with the placard at any AirAsia or AirAsiaX destinations. Your photos should identify the iconic landmarks or places of the destinations, for example, you posing in front of Petronas Twin Towers, Kuala Lumpur; or Tanah Lot in Bali, Indonesia. Submit your photos via the page. Winners will be notified via email and announced on the Travel 3Sixty website. Representatives and/or agents (including advertising & promotion agencies) of AirAsia Berhad, P.T. Indonesia AirAsia, Thai AirAsia Co., Ltd., AirAsia Inc., AirAsia Japan, AirAsia X Sdn. Bhd and Go Holiday Sdn. Bhd.